On first listen, String Cheese bares an incredible resemblence to the cultish San-Fran psych-folk outfit, “It’s a Beautiful Day”. Both bands have hopeful lyrics carried by angelic voices soaring over lush arrangements and spacious rhythms. In a word: magical. As the album progressed, I began to hear resemblences to Jefferson Airplane and their quirky forbear, The Great Society. I can hear both Marty Balin and Grace Slick in the vocals of Sally Smaller, and I am guessing she was only beginning to develop her repertoire. Unlike her female counterparts Pattie Santos and Linda LaFlamme of It’s a Beautiful Day, Sally’s voice hints at much darker qualities. 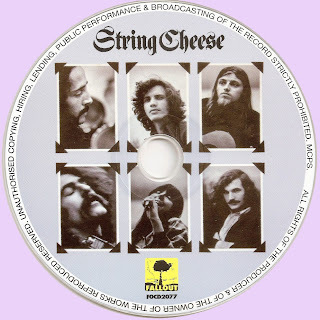 This together with the more electric approach of String Cheese means that had they survived, they may have ventured off into harder-edged musical territory. 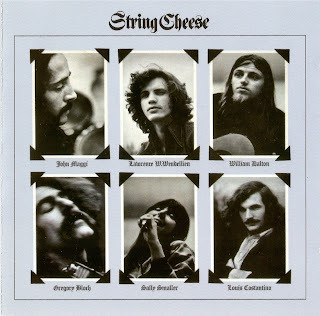 Considering the optimism of their lyrics, and the similarities to label mates like Jefferson Airplane, it’s surprising that String Cheese didn’t move from their home base of Chicago to join the Haight-Ashbury scene in San Francisco. The tight-knit musical community there must have appealed to Greg Bloch, and so he left String Cheese to replace David LaFlamme in It’s a Beautiful Day in 1973. Unfortunately, this move was poisoned by the fact that LaFlamme was forced out of the band he founded due to royalty issues. Other Haight bands like the Grateful Dead were experiencing similar financial problems at the time, and with the Summer of Love fading into the distance, the idealism of the 1960s was losing its momentum – even in San Francisco. 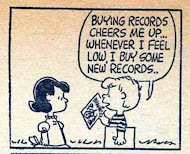 I’d be quite reluctant to say that another “Summer of Love” is just around the corner, but there definitely seems to be hope that musicians are beginning to understand the importance of community again. Here in Toronto, multi-instrumental collaborations are on the rise, and musicians often play in several bands simultaneously – partially for experimentation, but also to pay the bills. Albums like String Cheese offer up a taste of the magic that is possible for those who are committed to their craft. The open rhythm of Louis Constantino on bass guitar and John Maggi on drums lays a basic foundation for the lush melodies of Bloch, Smaller, Larry Wendelken (vocals, 12-string guitar), and the sea of instruments played by William Dalton: organ, piano, celeste, electric guitar, harpsichord, keyboards, sitar (acoustic and electric), classical guitar, and orator. What happened to the rest of String Cheese remains a mystery. Bloch went on to play with Mark-Almond (John Mayall’s former rhythm section), but the rest of the band appears to have just drifted into total obscurity. If you have any details, please feel free to post them as comments. I am really liking this. Thank you.